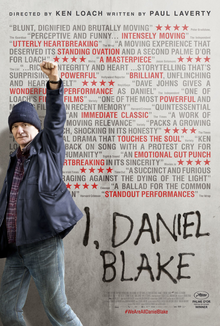 ‘I, Daniel Blake’ is a powerful piece of work about the state of the British benefits system, seen through the eyes of a 59 year old carpenter in Newcastle. It won the prestigious Palme D’or award at this year’s Cannes film festival, and it’s comfortably Ken Loach’s best film in years. The story focuses on the titular Daniel Blake (Dave Johns) as he tries to navigate the ‘Brazil’ esque bureaucracy of the UK’s benefits system, caught in a catch 22 situation between being unable to work due to a recent heart attack, yet unable to qualify for the requisite benefits as he didn’t meet the ‘criteria’ for the sickness benefit allowance. We follow Daniel as he goes about his daily life, carrying out DIY tasks, helping his neighbours and generally supporting himself, when he meets single mother Katie (Hayley Squires), who has moved to Newcastle from London after being evicted from the flat they rented. The film shows us how Daniel and Katie both attempt to navigate the complexities of the job centre and government red tape to get the support they badly need, and are clearly eligible for, whilst attempting to make the most of their lives in these difficult circumstances. There’s a Kafkaesque absurdity to most of the encounters with job centre personnel, be it in person, via phone or online, that would be comical if the consequences aren’t so severe. Loach’s work has always been overtly political and angry in nature and this comes through powerfully in ‘I, Daniel Blake’s narrative. This is not a subtle piece of work and Loach uses a sledgehammer to drive his point in home, but that’s kind of what makes it so powerful and affecting. The passion and righteous anger simmers through every scene and it makes for a compelling and timely parable for modern times. Showing restraint on occasion may heighten the realism but subsequently numb the message, and Loach has always focused squarely on the message first and foremost. I’m fortunate enough to have never had to use a job centre or be in a position similar to the characters in the film, but I was galled at the lack of common sense and decent humanity shown by the majority of characters who dealt with Daniel and Katie, and if this is an accurate reflection of real life, it’s appalling. Loach cast Newcastle born comedian Dave Johns in the title role and his performance is excellent for someone with limited previous acting experience, imbuing Johns with a warmth and local charm that make him both extremely likable and a perfect everyman stand in for people experiencing similar situations up and down the country. As Katie, Hayley Squires is a real find, and her and Johns build up a strong friendship based on the common situation they find themselves in. More than anything, the power comes from how ordinary Daniel and Katie are, and how they are decent hard working people who genuinely want to work but are unable too through circumstances outwith their control or a lack of opportunities. The benefits system is designed to cater for people like this, but somewhere along the way that purpose has been lost and ‘I, Daniel Blake’ wants to shine a light on how the system can crush the spirit of good people like Daniel and Katie. It is undoubtedly successful in doing so. At 80 years old and previously retired, Ken Loach is unlikely to have many films left in him, but ‘I, Daniel Blake’ is further evidence (not that it was needed) that he remains one of Britain’s finest and most important filmmakers.